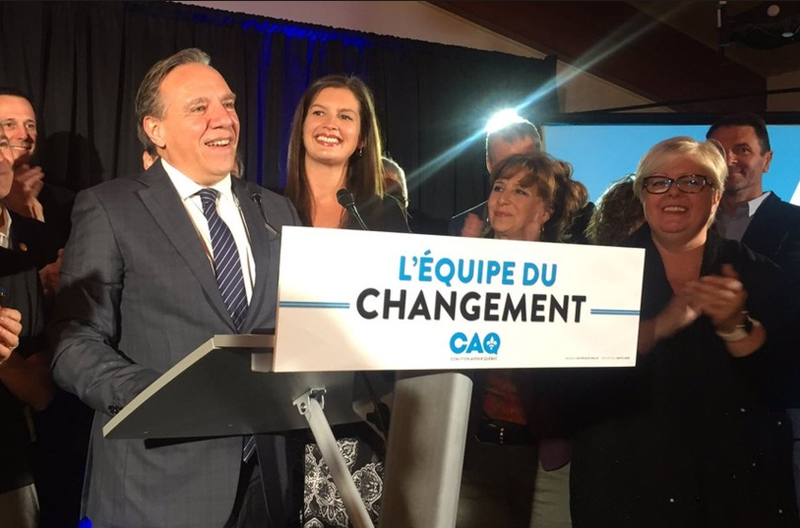 The populist rightwing Coalition Avenir du Quebec (CAQ) leader and premier-elect Francois Legault were celebrating after his party won a historic landslide victory, knocking Prime Minister Trudeau’s Liberals out of power in one of the country’s most important provinces. After nearly half a century of a two-party political rule (the Liberals and the Parti Québecois), the populists of Mr. Legault have won on a platform of anti-immigration and the need for ‘ordinary people’ to take over politics. The CAQ wants to cut immigration to the province and introduce a controversial plan to "expel" immigrants who fail to pass a language and values test within three years of arrival. Related coverage: <a href=" https://thegoldwater.com/news/37733-Canada-Election-Quebec-1-October-Vote-All-About-Immigration"> Canada Election – Quebec 1 October Vote All About Immigration</a>. Coalition Leader Mr. Francois Legault guided his right-wing political party that has only existed for seven years to victory following a simple 2-month campaign. Liberal Leader Mr. Philippe Couillard, who was ridiculed during the campaign for not knowing the price of weekly groceries (see our related coverage) and being out of touch with the electorate, may have won his own riding in Roberval, but conceded defeat early when results came in. Related coverage: <a href=" http://thegoldwater.com/news/37709-Canada-Election-Liberal-Leader-Couillard-Caught-Unaware-Of-Grocery-Cost "> Canada Election – Liberal Leader Couillard Caught Unaware Of Grocery Cost</a>. Mr. Couillard, the province's outgoing premier said that he had spoken to Mr. Legault to congratulate him. "I am proud of our accomplishments, confident in the future we have prepared, confident that our commitment is the right one," he told his supporters. "I am not bitter. I'm asking you not to be. I'm proud, and you should be too." Wow thats huge. Remember over the summer . when the liberals up there went off on that grandma. Asking her president real questions .they told her to shutup called her all kinds of names. Migrants should also be denied social benefits, at least, so long as there is even one Canadian in need. Correction: Trudeau Liberals are federal. Couillard Liberals are provincial, and the ones defeated in Quebec.